Hello, I have raspbian installed and exactly followed your instructions. However, the screen just keeps being white… Also, I cannot access my raspberry pi with my second screen after I installed the drivers, as ist does not seem to recognize it anymore… Please help. 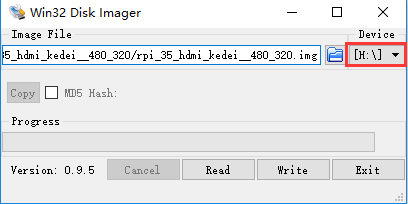 Do you mean you don’t install HDMI adapter on LCD and raspberry pi? I find it doesn’t connect with HDMI adapter, the LCD just show blue screen. What’s more, Do you mean you have install two screen at the same time? I have tried several times to install this to RuneAudio to no avail. It keeps crashing on the final step. – is it possible to run the screen as a second display on a computer? – is it possible to run it without a raspberry pi? Sorry, the answer is late. Q： is it possible to run the screen as a second display on a computer? We already tested and confirmed on a win8.1 computer（need hdmi cable&micro USB cable） . Display function 0nly . Q： is it possible to run it without a raspberry pi? USB cable），tablet（need Mini HDMI to hdmicable&micro USB cable），Basically support all devices which with hdmi output function.（Sometimes it may be necessary to lower the hdmi resolution to display properly）.Display function 0nly. Hello… I’ve bought this nice LCD, installed on my Raspberry PI 3 Model B and the display is properly activated. My OS is the standard Raspbian updated at this date. There is a way to activate the touch screen stylo without changing or blocking OS updates? Thanks. Hello… I’ve found the solution!!! When I try to change the executable permissions of file I get, No such file or directory on the terminal. I carefully copied and pasted the command. I tried twice. Exactly where should the driver folder be pasted to? The step describing how to do it seemed unclear to me. Perhaps that’s where I made a mistake. Thanks for your help. i have tried to uninstalll the drivers but i end up with the message again. please help me as the 3.5″ screen is too small for my purposes. Hey man, i have the same problem, how could you solution it? ; could you help me! Is it possible to rotate the screen and the touchscreen?